Welcome to stampdutyregistration.com, a site dedicated to real estate related legalities, formalities, charges, incidentals, professionals and relevant details. Stampdutyregistration.com is also about property professionals, real estate consultants, stamp duty agents, real estate lawyers, title investigators, home loan agents, property valuers, vaastu consultants, property developers and much more. 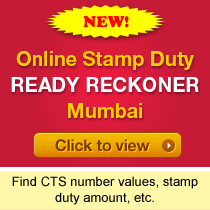 Find and share stamp duty details, registration office addressess in your location anywhere in India, understand stamp duty calculations, registration formalities, procedures, technicalities, know franking centres in your area, e-stamping procedures, adjudication, online registration token booking procedures, discuss real estate legalities online, find property professionals in your locality or anywhere across India. Feel free to search for stamp duty, registration, property professionals' information and let us know if we can do anything different. We would appreciate your invaluable feeback to improve our services furthermore.